Women harbor various kinds of fears and phobias. Some superficial; others rooted deeply in the sub-conscious mind; arising from some action of the past. Many of the fears are triggered off by some sensation which triggers off a chain reaction that refreshes some unpleasant memory of the past. After this deep rooted fear rises to the surface, it starts taking shape in some form or the other. Amongst the most common fears are fears of intimacy, guilt complex of not sparing time for the family, social fears and those of a relationship coming to an end. A lot of these fears develop over a period of time, each owing to some unpleasant action, which gets stuck in the deepest memory. 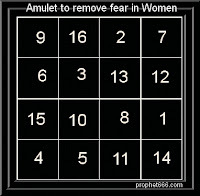 In this post here is given an amulet which believed to remove fears and phobias in women. The amulet which is an ancient Indian Yantra has to be inscribed on a piece of copper. Then while going to bed it has to be kept under the pillow. The numbers given in this amulet can be written in any language.